Banning guns works, which is why New York, DC, & Chicago cops need guns. Washington DC’s low murder rate of 69 per 100,000 is due to strict gun control, and Indianapolis’ high murder rate of 9 per 100,000 is due to the lack of gun control. The Brady Bill and the Assault Weapons Ban, both of which went into effect in 1994 are responsible for the decrease in violent crime rates, which have been declining since 1991. When confronted by violent criminals, you should “put up no defense – give them what they want, or run” (Handgun Control Inc. Chairman Pete Shields, Guns Don’t Die – People Do, 1981, p. 125). One should consult an automotive engineer for safer seat belts, a civil engineer for a better bridge, a surgeon for internal medicine, a computer programmer for hard drive problems, and Sarah Brady for firearms expertise. The 2nd Amendment, ratified in 1787, refers to the National Guard, which was created 130 years later, in 1917. The National Guard, federally funded, with bases on federal land, using federally-owned weapons, vehicles, buildings and uniforms, punishing trespassers under federal law, is a “state” militia. These phrases: “right of the people peaceably to assemble,” “right of the people to be secure in their homes,” “enumerations herein of certain rights shall not be construed to disparage others retained by the people,” and “The powers not delegated herein are reserved to the states respectively, and to the people” all refer to individuals, but “the right of the people to keep and bear arms” refers to the state. “The Constitution is strong and will never change.” But we should ban and seize all guns thereby violating the 2nd, 4th, and 5th Amendments to that Constitution. Rifles and handguns aren’t necessary to national defense! Of course, the army has hundreds of thousands of them. Private citizens shouldn’t have handguns, because they aren’t “military weapons”, but private citizens shouldn’t have “assault rifles”, because they are military weapons. In spite of waiting periods, background checks, fingerprinting, government forms, etc., guns today are too readily available, which is responsible for recent school shootings. In the 1940’s, 1950’s and 1960’s, anyone could buy guns at hardware stores, army surplus stores, gas stations, variety stores, Sears mail order, no waiting, no background check, no fingerprints, no government forms and there were no school shootings. The NRA’s attempt to run a “don’t touch” campaign about kids handling guns is propaganda, but the anti-gun lobby’s attempt to run a “don’t touch” campaign is responsible social activity. The right of Internet pornographers to exist cannot be questioned because it is constitutionally protected by the Bill of Rights, but the use of handguns for self defense is not really protected by the Bill of Rights. Free speech entitles one to own newspapers, transmitters, computers, and typewriters, but self- defense only justifies bare hands. Charlton Heston, a movie actor as president of the NRA is a cheap lunatic who should be ignored, but Michael Douglas, a movie actor as a representative of Handgun Control, Inc. is an ambassador for peace who is entitled to an audience at the UN arms control summit. Police operate with backup within groups, which is why they need larger capacity pistol magazines than do “civilians” who must face criminals alone and therefore need less ammunition. We should ban “Saturday Night Specials” and other inexpensive guns because it’s not fair that poor people have access to guns too. Police officers have some special Jedi-like mastery over handguns that private citizens can never hope to obtain. Private citizens don’t need a gun for self- protection because the police are there to protect them even though the Supreme Court says the police are not responsible for their protection. Citizens don’t need to carry a gun for personal protection but police chiefs, who are desk-bound administrators who work in a building filled with cops, need a gun. When Microsoft pressures its distributors to give Microsoft preferential promotion, that’s bad; but when the Federal government pressures cities to buy guns only from Smith & Wesson, that’s good. Handgun Control, Inc., says they want to “keep guns out of the wrong hands.” Guess what? You have the wrong hands. That’s my type of sarcasm! Re #12: 1791, along with the rest of the Bill of Rights, not 1787. That’s very funny! :-). Maybe I’m just an old grumpy soldier, but my pateince for antis is gone! I now tell them that they’ are not “anti gun” but are in fact “pro civil war”!’ That’s an uncomforatable truth but it is a fact that I wish NRA would spread both far and wide! Also why isn’t NRA organizing a Boycot of all non gun business in states like California? Ie no Mr Schwartzenegger the wife and kids and I will NOT be visiting Disneyland! No we will take the kids to 6 flags over Texas instead! I’m just tired of the games , we need to take the fight to the enemy at every opportunity! PS I asked the NRA why they don’t do this and got no response. Maybe one of you duck hunting benefactor or patron members can do better? Molon Labe ! 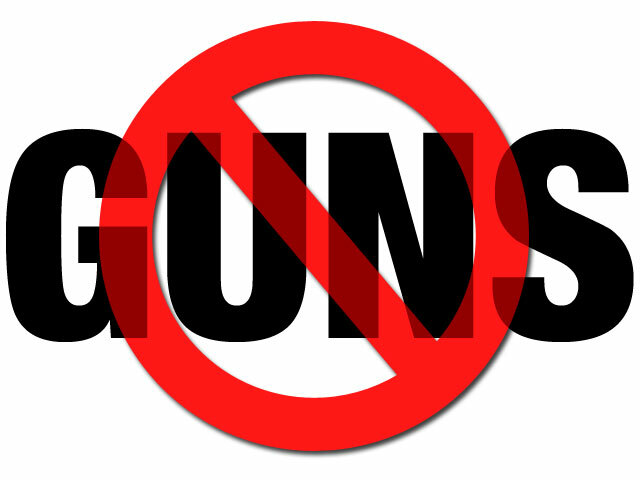 Its high time for a ban on all guns….why do people need a gun for protection? theres something wrong there! why do i need to coceal a wepon? i say melt them all down and the country will be a much safer place. oh and that goes for the cops to. I wasn’t aware we had a “bill of needs” in this country. Why do you need alcohol? Tobacco? Cars that exceed the speed limit? As to it being a safer place, muscular punks who pick on small or disabled people love you. What kind of “Sarge” are you? As far as banning guns–we discussed this in the Supreme Court. Your side lost. I think Sarge was providing sarcasm. Though banning them from the cops is always a fun suggestion, to see how people react. I actually think we should disarm many police patrols. Kind of like the UK. I think traffic officers should be separate from regular officers and they should be disarmed and not have any special arrest powers. This would eliminate pretext traffic stops accet when somebody was already a suspect( a regular officer could still make a traffic stop IF he had time) and make us a much more free people. And before anybody starts saying I want to take away cops 2a rights. No I dont. BUT limitations on rights should be a prerequisite for employment by the governemt. I do want to take away all civilian government employees voting rights until they quit or retire. criminals are criminals, they wont follow the law. what makes you think they will follow this one? when the UK banned guns it took forever for the guns to be completely gone out of circulation, dispite the fact that guns were still being importated illegaly from other comtries. then when most guns were out, murder rates with sharp and blunt objects went up. with obama plan to not stop imagration from mexico drugs, and guns will continue to be illegaly imported into the united states, the criminals who do not follow the law will be able to purchase these weapons via numeous black markets. so when that criminal who now illegaly purchased a gun robs you in your house, what will you do? if you are on one side of the room with no gun, but a sharp object being, whatever. who do you think will win? the man with the semi auto gun or the man with a knife? the criminal wont hesitate to pull the trigger. lets say at the conneticut shooting, every teacher had a shotgun locked in a closet. when the killer walkd in a classroom with an AR-15, and saw the teacher holding a 12 gage in his face, what do you think he would do? if he fired 1 shot the into the tacher and she didnt fire the gun imediatley after, every single teacher would here the gun shots, and run in with their guns. this is all im going to say now, because i am on a mobile device and i dont feel like ranting into blank minds so if you have any doubts/question feel free to leave a comment. O.K., now I get it! and all this time I thought “shall not be infringed” meant “shall not be infringed” silly me! FANTASTIC! :-) Skewers pretty much every one of the ongoing arguments out there… Well done Sir! Well it is time to go purchase my next firearm. This list is great… I should go do the research on all these just to start arguments with the people that refuse to carry or own a gun and help convince those yuppies. I hate yuppies. hehe yea gun related sarcasm is like kryptonite to yuppies and hippies. I’ve recently begun work on a piece of pro-firearms literature, and I have to say, I hope you don’t mind if I take some of these. I especially love number 37 and 39, and I already touched on #12. Thanks for all this, plus that article about Kennesaw. It’s all really coming together now! Thanks Hawk. The list is attributed to no one in particular so I say go for it. Glad you’re finding my blog to be a good resource! http://www.michaelzwilliamson.com/rants/guncontrol.php actually, it’s from my list here, which has previously been published in short form in America’s First Freedom, Canadian Shooting Sports, and other venues. Please distribute as widely as you like, and please credit me. Thank Michael, great list! Put your site as the source. Wow, I’m pretty sure every one of these is a fallacy. ya know…. guns dont kill people…stupid people kill people….. if the guns kill people…lets put the guns on trial and let the killers go…because it the guns fault right? Sarcasm at its finest–and common sense, as well. Isn’t it funny how common sense really isn’t that common? Every day is a good day to buy ammo. *we should have laws against guns brought to you and/or enforced by institutions as trustworthy with the handling of weapons as, say, the ATF. This point seems especially prescient in the days of F&F. Great list, but a question on #15. How does one have their 5th Amendment Right violated during seizing of ones personal firearms? No taking of private property without due compensation. That was a funny 40, I think who ever wrote this is young, naive, priviledged, among other things. Telling a woman who has been sexually assault that they are morally correct instead of killing her assailant is just plan dumb. Next you will won’t to ban knives, axes, hammers, cars, buses, trucks, cliffs, ropes, or anything that can kill you easily. Hmmmmm, how about water, people drown everyday! It’s called “Satire.” Mocking through logical extrapolation. That is so funny, well atleast this is still a free country, your ideas are great for a world of meek, weak, people who can hold hands and sing together, but reality is simple and clear, the strong rule, the weak follow, and the desperate……well the desperate have big ideas to control all with weak ideas to no avail. It would be nice if the world was a peaceful place, but human beings will always fall back on their animal instincts, if someone was trying to kill you and you had a gun I am sure you would use it, if not right away after a few stab wounds and kicks later. Or would you would die morally and peacefully, against your natural instinct to defend yourself. If so, I am sure there are some unmoral criminals that would love to meet you, rob you, beat you and give your address to their friends because you are easy prey. This is so funny, I gotta tell my friends about this list. Congratulations. You also have missed the point that it’s satire, mocking the gun control movement. God this is such a great post. Can some of you that missed it the first time, re-read it again? Or shall we have the government read for you too? Look, you guys are morons, I’m 17 and even i know, the founding fathers gave us the right to bare arms, so that we may protect ourselfs from the government, great quote, “To take down a country, you must first disarm it.” I may not have a degree, but i can say its common sense that you will feel safer knowing that if someone came into my home at night, with a LARGE KITCHEN KNIFE, i have a gun to protect myself with. 2nd admendment people, it is my right to look after myself, and my family, and if you cant see logic in that, then i fell sorry for you, because you will never have the correct thinking to make it on your own. Good list. The only reason they want to talk about banning guns is to cover up the fact that they are a fascist dictatorship. A true patriot must always be ready to defend his country from his government. The Constitution was signed mostly by racist and sexist men centuries ago, their intentions with the second amendment was to prevent invading forces and a corrupt government from taking over. However considering those scenarios applied more to hundreds of years ago rather than modern day render civilian use for guns almost useless. Banning guns is an idiotic and senseless idea, however, the country needs stricter gun laws to provide only people who absolutely need it, not just for assurance. All in all, people just need to keep an open mind about the opposing sides of gun control.